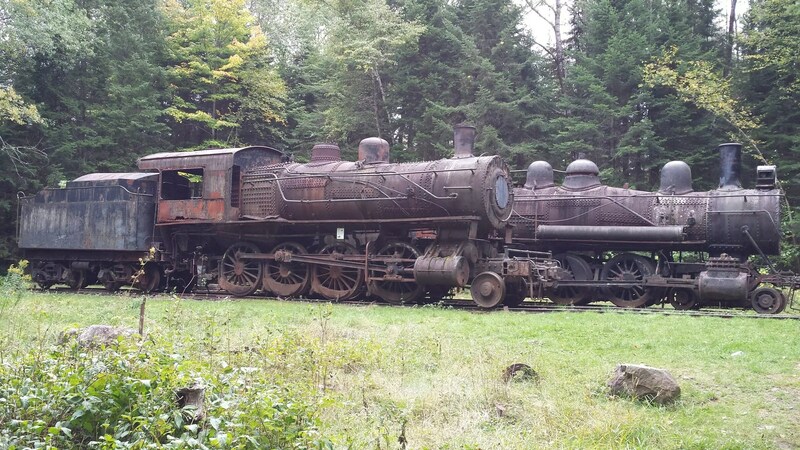 Two full-sized trains rest quietly in the Northern Maine Woods, abandoned in the early 1930’s from the Eagle Lake & West Branch Railroad. How do you find them? It’s easy, and I’m going to give you the most comprehensive directions you’ll find on the internet! 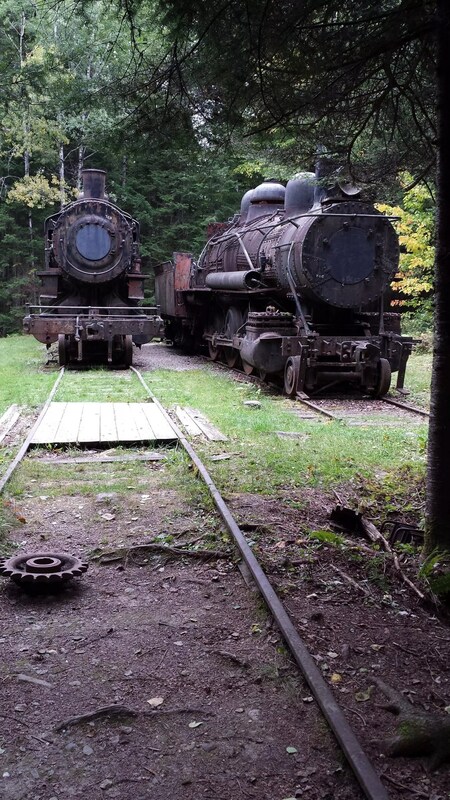 Locomotives abandoned in the Northern Maine Woods. 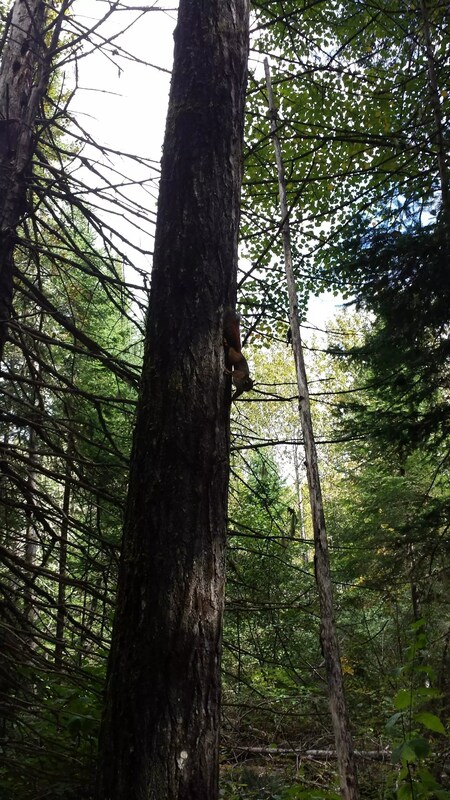 Love the Maine Outdoors? Subscribe! Got the wrong season? Click here for directions to visit the abandoned locomotives in the winter by snowmobile! Use these directions at your own risk and make sure you are prepared, especially in the colder months. Bring extra food and water, and a blanket or clothing to keep you warm in case you break down or have a flat you can’t fix. Note that most of the driving to get there will be on logging roads. 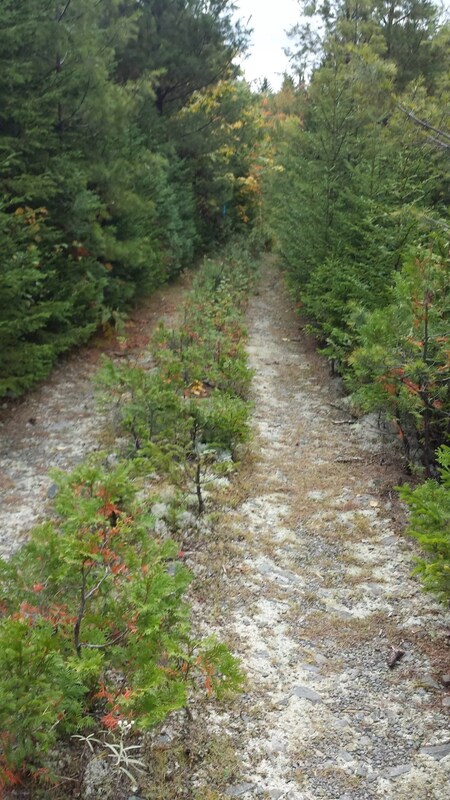 Logging roads are dirt roads and are built for tractor-trailer trucks loaded with tree length logs to move the timber out of the woods and to the mill. This means they have the right of way on the roads. They don’t drive like your grandma, so stay out of their way when you see them coming. Better yet, you might even want to pull over when you see them coming if you’re new to this. Logging roads are typically covered in broken shale, which means there is a high risk of getting a flat tire from driving on these roads- especially near the edges of the road. Make sure you have a spare tire (or two!) with you, a jack, tire iron, tire repair kit, air pump, and someone who can change a flat! When the logging trucks aren’t going by, moose and deer own the roads. Watch out for them, because they may not be watching out for you. There are hardly any identifying road signs on the logging roads, so don’t bother looking for any. Once you go above Kokadjo your cell phone will be good for telling the time and taking pictures…that’s about it. If you’re planning on going during the winter, I’d recommend only going on snowmobile. If that’s the case, don’t follow these directions- there are snowmobile trails that will get you there much faster. Just follow the signs on the trail. If you’re planning on going during mud season (spring), you may want to change your plans. Or make sure your vehicle has a winch on the front of it. If you go during bug season (late mud season through mid summer), you are definitely going to want to bring some bug spray. Trust me on this one. 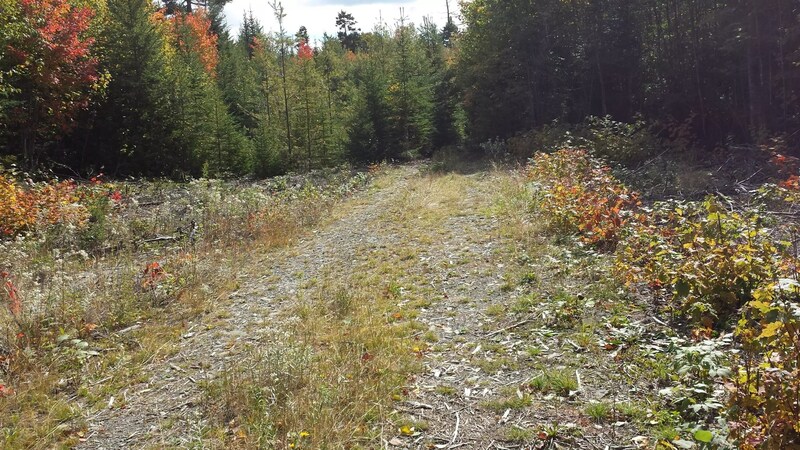 If you didn’t have a good understanding of the Northern Maine Woods and logging roads before, you sure do now! “Bear to the right” means there are two roads in front of you, including the one you are on, and you want to stay on the road in the direction that is to your right. This could be considered “straight,” but I’m calling it “right.” In the photo above, there is a road that goes to the left–in this case I would say “bear to the right” (aka “go straight”) as sometimes it can be confusing as to which road is the “main” road, as there are no road signs on logging roads! I have also listed CHECKPOINTS to look for so you know you are on the right track. If a checkpoint is a sign, that does NOT mean go that way! It just means that you see the sign, and therefore are on the right road. Please be advised that signs blow down from the weather, or could have been removed since I created these directions. If you do not see a checkpoint sign that does not necessarily mean you are on the wrong road. Look for the next checkpoint and check your map! (Always bring a map). Speaking of maps, I use “the bible” of all Maine maps- The Maine Atlas and Gazetteer by DeLorme. I highly recommend you invest in one, and these are the maps I am referring to when I give map numbers. DeLorme is a Maine company and they produce the BEST maps of Maine by far! For a rainy day side adventure you should stop by the DeLorme store in Yarmouth to see Eartha, the world’s largest revolving/rotating globe (Guiness World Record holder!) It is an amazing sight to see right inside the store! Drive to the small town of Kokadjo, just north of Greenville. The pavement will end in Kokadjo right after the pond and the general store and turn to dirt. Stay on the main road, NOT the road to the sporting camps which is on Smithtown Road. Continue going straight, not towards Sias Hill Cutoff Road. Drive through the large yellow pillars. Go forward past road to Big Spencer Mountain Trail. CHECKPOINT: One lane bridge then a “Stop Ahead” sign. When you come to the end of the road and stop sign you will take a right onto Golden Road. There is no sign that shows you have reached Golden Road, just a whole bunch of hunting camp and lodge signs. CHECKPOINT: Driving past Chesuncook Lake, you will see a driftwood beach. CHECKPOINT: The road becomes a mix of pavement and dirt. CHECKPOINT: Allagash Gateway Cabins sign. 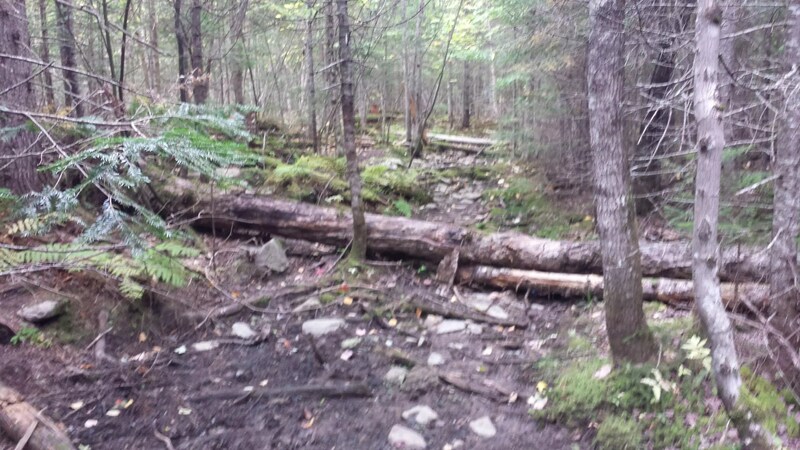 NATURAL LANDMARK: There is a turnout near the power lines- pull in here and look for a trail. Just a short walk and you will see the beautiful Ripogenus Gorge! The road will divide- go LEFT onto Telos Road. TELOS CHECKPOINT: You must stop at the Telos Checkpoint and give them your personal information. There is a fee of $7/per person to use the Telos Road. When you return you must again stop at Telos Checkpoint to let them know you are leaving the area. Go past Telos Mountain Road which will be on your right. CHECKPOINT: Allagash Wilderness Waterway sign. If you look at the map, it looks like the road will come to a “T” stop and you will be able to choose left or right. In reality, the main road (Telos Road) will take a sharp right where a rest stop area lies in front of you. It really is a rest stop, fully equipped with porta-potties! Great place to take a quick break, and when you reach this point, you need to turn LEFT off of Telos Road and onto Guy Allen Road/Longley Stream Road. Again, don’t bother looking for road signs, because there aren’t any. CHECKPOINT: The road will become more narrow. Take a RIGHT at the fork onto Grand Marche Road. You will see a “Trans Canada” sign, but no sign for Grand Marche Road. CHECKPOINT: Sharp 90 degree corner and a Johnson Allagash Lodge sign. There is a sign that says you are on Ellis Roy Road- maybe that’s another name for Grand Marche Road, I don’t know, but either way, don’t let it fool you. You’re on the right road, so stick to the main road. CHECKPOINT: Continue on main road, do NOT turn left onto Ledge Road, heading towards Loon Lodge. CHECKPOINT: West Road will be to your left and Chamberlin Lake Road will be to your right, stay on the main road. Just beyond mile marker 15 there are 2 dirt roads to your right. Both will take you to the trail to the steam locomotives. We took the second road on the right because it looked easier to drive. If you take the first road, I don’t have any directions for you- you’re on your own! If you take the second road, drive in until you can take a right turn, take the right turn, then drive until you come to a rock barrier across the road. Park here and start walking! The hike in takes less than an hour on average. 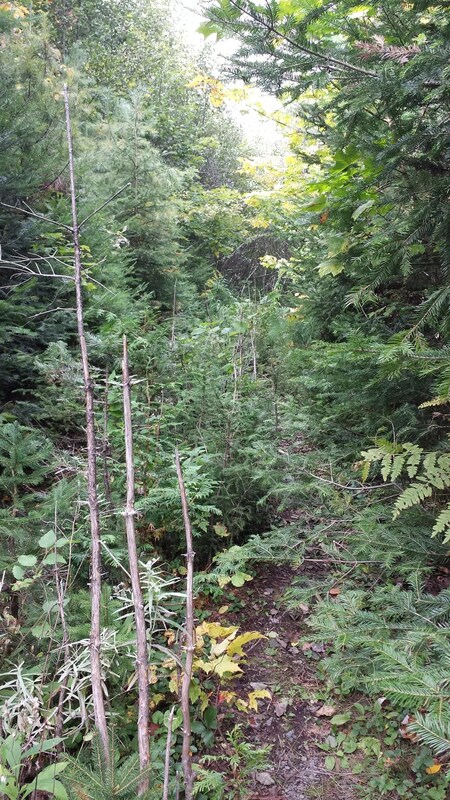 Eventually that road comes to an end and you will then enter the woods, as you can see in the picture below. 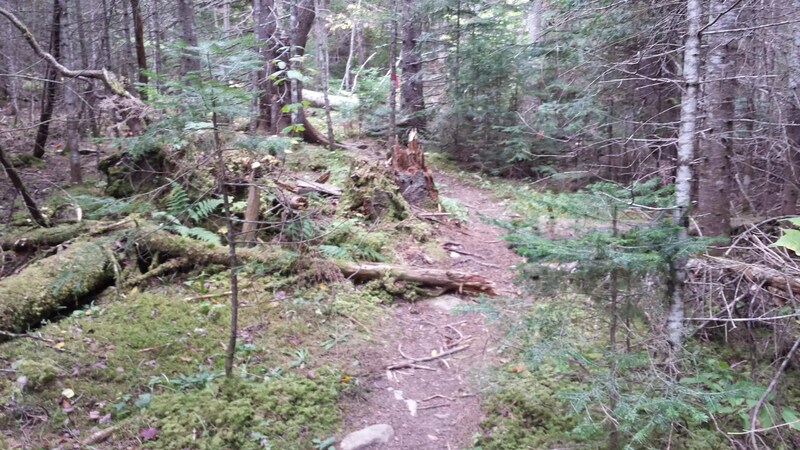 Continue walking towards the woods and you will see a trail begin. Keep looking for the colored flagging tape tied to trees and branches to show you the way. 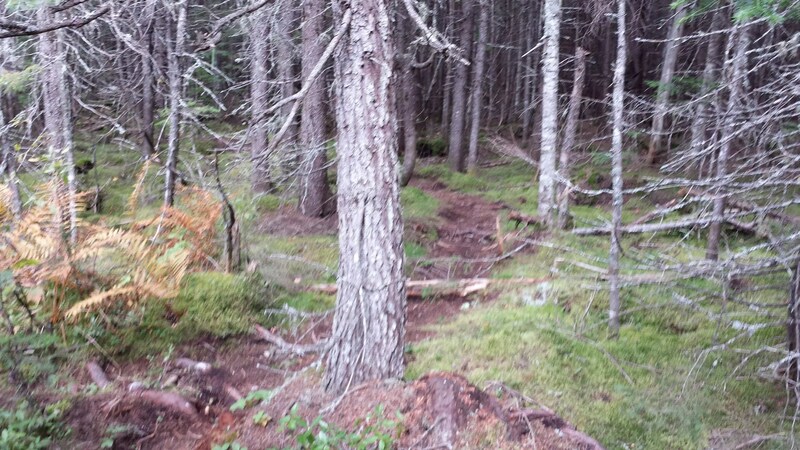 The trail into the woods goes through several changes. You will stay on a road for a while, but sometimes the trees will be so thick it’s hard to tell you are actually on a road, as you can see in the second picture below. If you look closely, you can see a small path to the right of the photo. 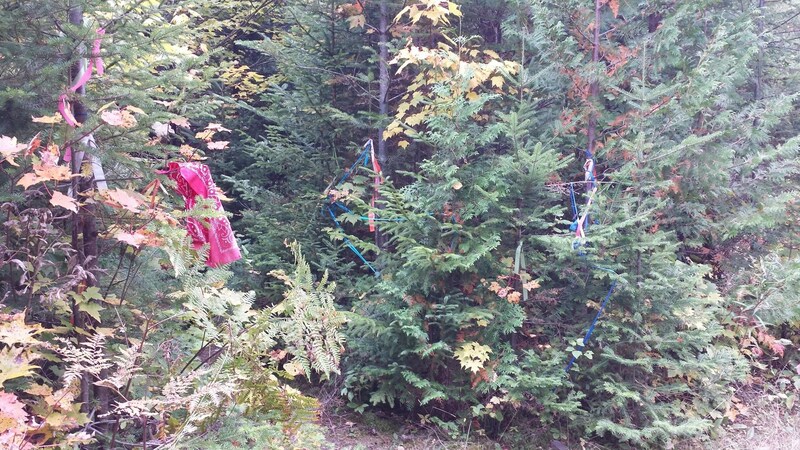 You will know you have reached the trail head in the woods when you see a bunch of flagging tape, ribbon and bandanas tied to branches. The road you are walking on continues straight but you will turn left here to continue on to the trail to the locomotives. From here the path is pretty clear, but continue looking for the flagging tape if you aren’t sure you’re on the right track. The trail winds through the woods. Conditions can get rather muddy, so be sure you have footwear on that you don’t mind getting muddy or wet! 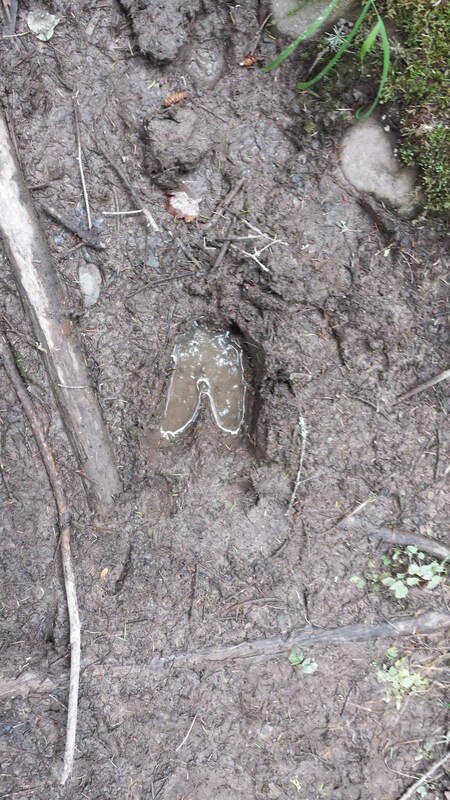 Sometimes the trail is clear and well defined. Moose and deer use the trail to the steam locomotives as well. Keep your eyes open, you may see one! 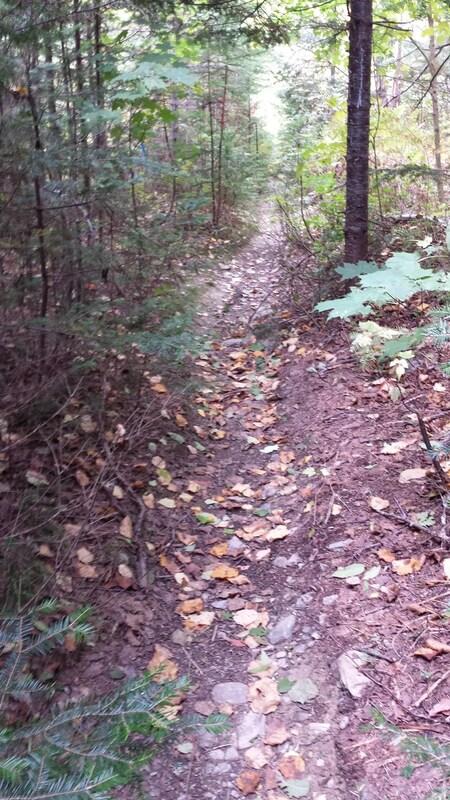 Some parts of the trail go through dense forest. Make plenty of noise if you don’t want to surprise or encounter any wildlife! …and you’re almost guaranteed to make some of the locals mad you’re there! 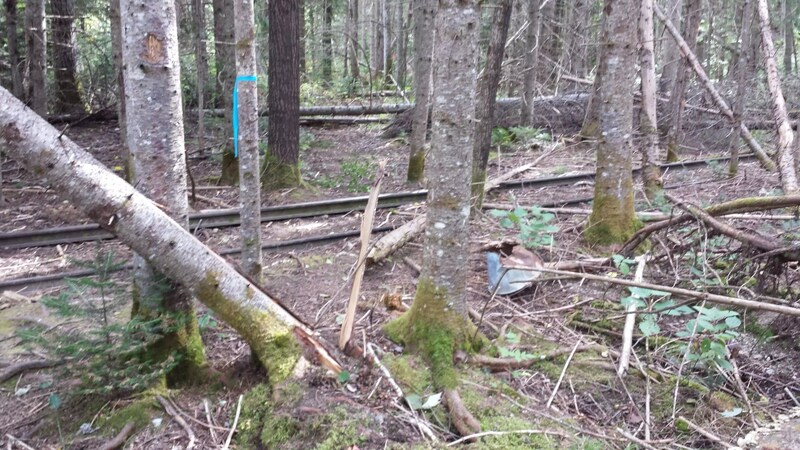 You know you’re getting close when you start to see railroad tracks in the woods! The trail doesn’t follow the tracks at first, it crosses them a few times winds through the woods until finally you are walking down the tracks. Eventually you will start to see debris in the woods (iron pieces of boilers, skis, wheels, cogs, etc.) and you will know you are getting close. Finally you’ll see a clearing up ahead, and as you get closer you will notice the two iron ghosts that rest in the clearing. Have fun exploring in and around the locomotives, and just reverse the directions to find your way back! Enjoy the adventure, safe travels, and as always, Stay Untamed!